The autumn solstice is almost upon us, and with the fall season comes football and your chance to show off with a custom pennant flag. We at Dori Pole love showing off our favorite team’s colors in a fun, eye-catching way, and with Dori Pole, you can too. From your front yard to a pre-game tailgating session, you can fly your colors with pride. Whether you’re a fan of college ball or pro, or even both, you can fly your favorite team’s colors. We offer two color, 8’ pennant flags that are perfect for representing the major collegiate teams. With the selection of solid colors and side by side options, you can also fly a pennant flag for your professional team with pride. The high-flying poles and pennant flags of Dori Pole are sure to show others your dedication to your favorite team. With the different mounting brackets from Dori Pole, you can have your pennant flag flying high no matter where you take it. The ground stakes make it easy for you to install a Dori Pole right in your front yard, telling your neighbors what team it is you support. If you want to take your equipment with you to the game, then the wheel stand is the best option for you. 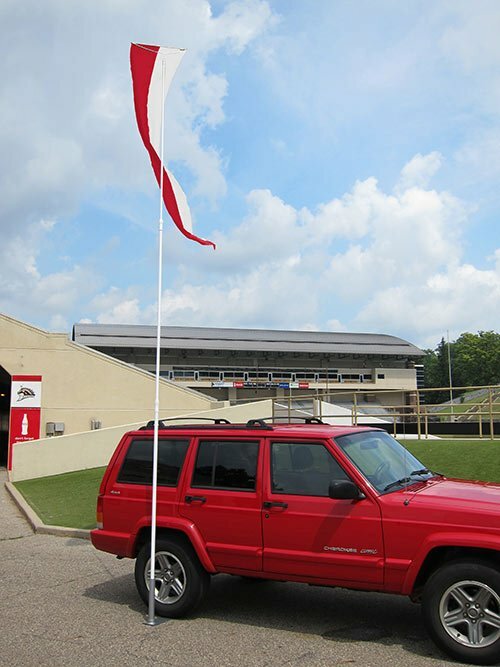 Fitted right below the wheel of any vehicle as an anchor, the wheel stand can fly your team’s color right from the parking lot and take your tailgating to the next level. At Dori Pole, we offer different full kit options that come with everything you need for game day. If you want to fly your flags from your home, the two-color advertising/event kit can work perfectly. If you want your pennant flag on the go, then the tailgating kit comes with everything you need to set up your Dori Pole on the move. With over 30 years of experience attracting and welcoming people to events and homes, Dori Pole is the eye-catching solution you need. Available in a variety of models and sizes, you can find the perfect pole for you today! Filed under Custom Pennant Flag. Matt Davis on Limited Edition Specialty Pennants Now Available! Jayne Weaver on Limited Edition Specialty Pennants Now Available! Dori Pole Pennant System has attracted and welcomed people to special events since 1984 with its colorful visual “noise-in-the-sky” presence. The brainchild of landscape architect Vince Mackel, the eye- catching pennants flutter playfully above the crowd, inviting people to join in the fun/celebration.